Baluster shaped vase of cloisonné enamel on a copper base. Decorated with chrysanthemums and a butterfly in moriage on a graduated beige/beige-blue ground. Signed: seal mark of Andō Jūbei. The Andō factory specialised in larger pieces of cloisonné; not the largest, but of considerable size. Eclectic in design, the factory kept up with demand and used most of the innovatory techniques as they appeared. 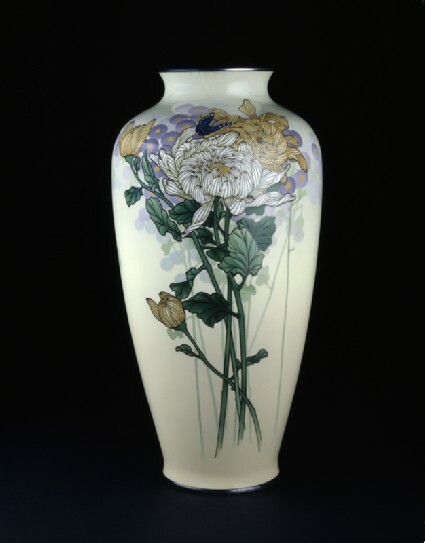 By the first decade of the twentieth century, the factory was fully adapted to the Art Nouveau style, making large-scale pictorial patterns that conformed well to the shapes used, and with the frequent use of raised cloisonné enamel (moriage) that sounds almost like a contradiction in terms. One of the leading factories from the mid Meiji period, that factory is still working.